On Saturday I went to a local quilt show with DD. 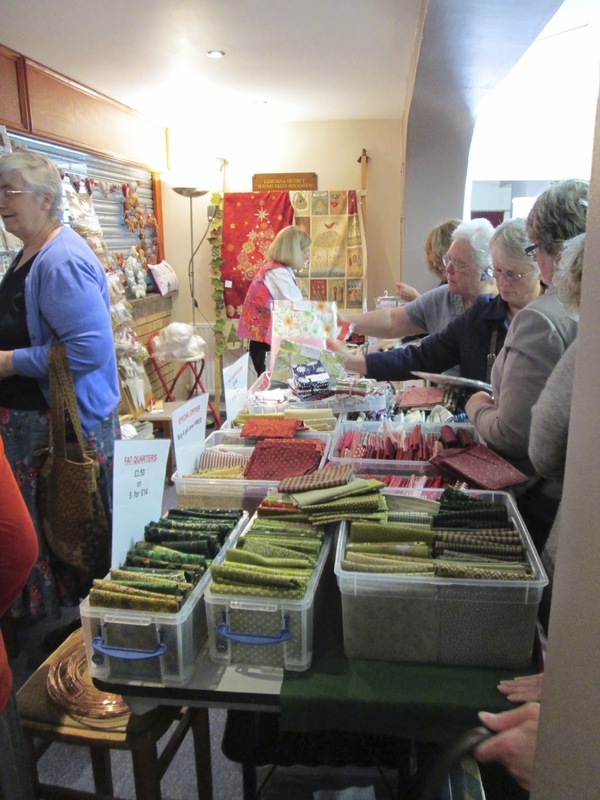 The show was the second "Quilts in the Wolds" show organised by Lindsey Patchworkers. This is a hanging that a group of members created for Lincolnshire Wolds Area of Outstanding Natural Beauty, it shows many of the attractions of the region. 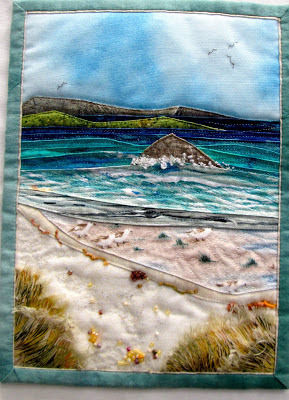 DD and I were both focussed on water/seascape related projects, and even choose the same piece as our "visitors' choice". Our photographs are mainly along this theme. As ever, if you are in a picture and would rather not be or if you object to my sharing the work you exhibited please email me and I will remove it immediately. was lovely, it was as if it was possible to walk right onto the beach. 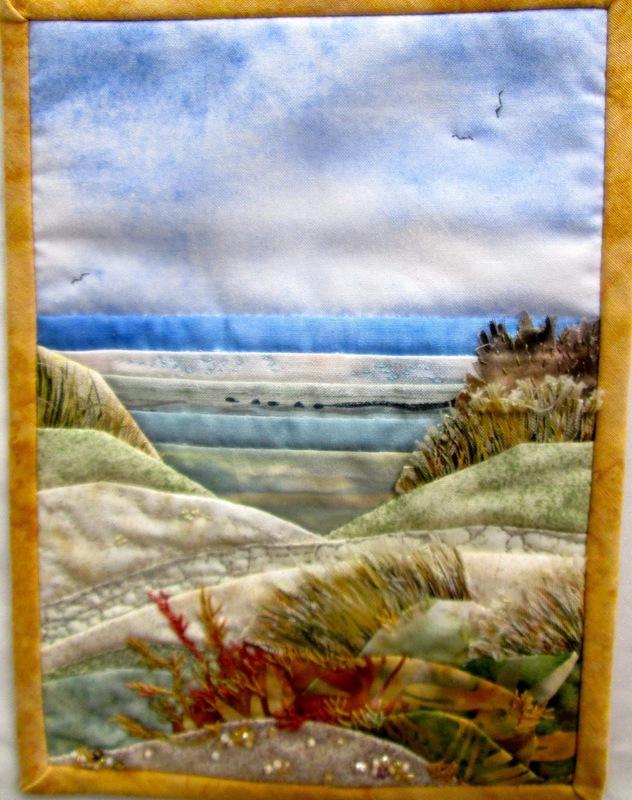 You've shown some wonderful pieces Lis, thank you so much. Very inspirational seascapes. Wonderful little miniatures there. My favourite is the top one by Sandra. 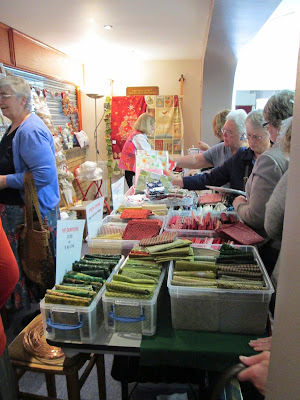 She has used beautiful colours.The tombola sounds like a good idea - hadn't heard of that. Wonderful seascapes - I love the barefoot beach and can practically feel the sand between my toes! i love seascapes! i haven't been to barefoot beach, but my sad lines about an hour away from Naples and has taken us to his local beaches, and wow, she has captured them perfectly! How interesting! These pieces remind me of the little one that you gave me some time ago...a long time ago, it seems now! Lived in Aberdeen, 16 miles from Stonehaven, the quilt is so acurate it brought back loads of memories the many days spent there. 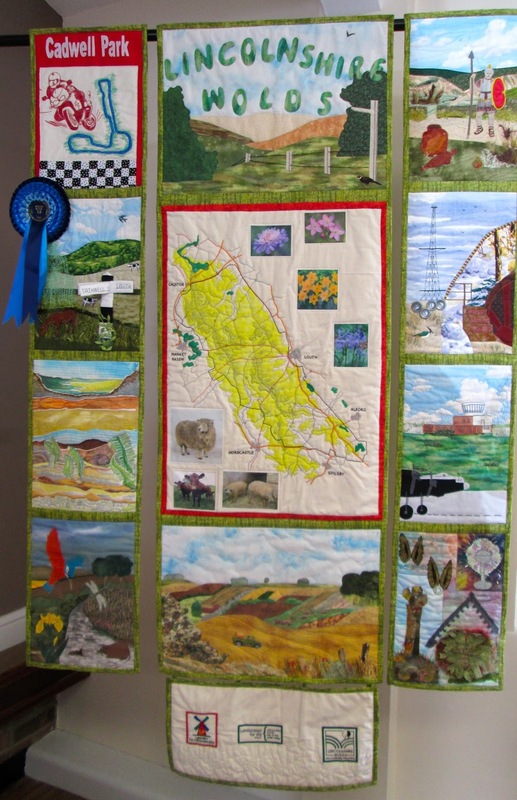 Now live in East Riding an would love to quilt pictures like these. Is there any where local that I can learn?